We've rounded up the best J.D. Salinger tributes, stories, and interactive maps. Did you know that a letter from Salinger to a film producer who wanted the rights to Catcher in the Rye can be yours for $54,000? Not to mention, God help us all, the immeasurably risky business of using actors. Have you ever seen a child actress sitting crosslegged on a bed and looking right? I'm sure not. And Holden Caulfield himself, in my undoubtedly super-biassed opinion, is essentially unactable. A Sensitive, Intelligent, Talented Young Actor in a Reversible Coat wouldn't nearly be enough. It would take someone with X to bring it off, and no very young man even if he has X quite knows what to do with it. And, I might add, I don't think any director can tell him. In Slate, Dana Stevens analyzes the letter and writes that "just as Salinger retreated into his own enigmatic authorial persona-the writer defined by his refusal to write, or, at any rate, to publish-Holden Caulfield came to represent the uncastable sublime: a character whom everyone identifies with but who no one is allowed to play." NPR re-ran a great StoryCorps episode from 2007, about a man from Wisconsin who tracked J.D. Salinger down at his house in Cornish, N.H. in the late 1960s. He knocked on the door and it started to rain, and Salinger invited him in. The New Yorker has published online the 13 short stories that Salinger wrote for the magazine, including "A Perfect Day for Bananafish" and "Slight Rebellion Off Madison," which became the basis for Catcher in the Rye. TNY has also republished Louis Menand's 2001 piece about the 50th anniversary of the publication of Catcher in the Rye. He analyzes the temptation to conflate Salinger and Holden Caulfield: "By dropping out, Salinger glamorized his misfits, for to be a misfit who can also write like J. D. Salinger-a Holden Caulfield who publishes in The New Yorker-must be very glamorous indeed." There's also Joyce Maynard's 1972 story for The New York Times Magazine, "An 18-Year-Old Looks Back On Life," which is always worth a re-read. Was S. committing slow artistic suicide within the Wall, silencing himself within the Glass house of his Glass family chronicle? Or had he achieved some strange new level of spiritual or artistic transcendence-writing that no longer required the ego validation of publication or readers, at least within his lifetime? Or-horrible though-was he writing now only for God's eye and planning to pull a Gogol: feed the work to the flames before he died? The Rutland (Vt.) Herald wrote about how Salinger's neighbors protected him from stalkers and fans—by giving them faulty directions to Salinger's home. My mind is stocked with some black neckties, and though I'm throwing them out as fast as I find them, there will always be a few left over. I am a dash man and not a miler, and it is probable that I will never write a novel. So far the novels of this war have had too much of the strength, maturity and craftsmanship critics are looking for, and too little of the glorious imperfections which teeter and fall off the best minds. The men who have been in this war deserve some sort of trembling melody rendered without embarrassment or regret. I'll watch for that book. The New York Times's interactive map of Manhattan locations in Catcher in the Rye: Roll over locations and the quote from the page in the novel comes up. In the Times, Chip McGrath remembers trying to check Catcher out of the public library in Brighton, Mass. and needing a permission slip from his mother. 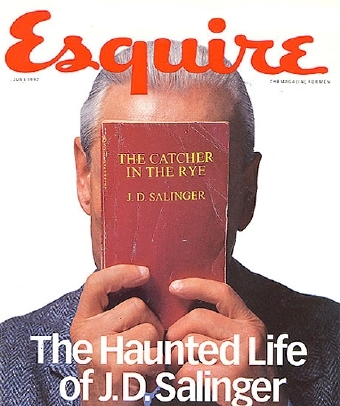 Vanity Fair's Claire Howorth looks at representations of Salinger and Holden Caulfield in popular culture (and crazy person culture: she reminds us that John Lennon's killer, Mark David Chapman, had a copy of Catcher in the Rye with him when he shot Lennon). Michael Wolff tactfully noted that when he did a post about Salinger last month, it got little traffic: "In truth, he SEO'd poorly." The Onion noted: "Bunch of Phonies Mourn J.D. Salinger."